Every year, the European Audio-Visual Observatory publishes its annual review of film industry trends in time for the Cannes Film Market. You can download the Focus 2010 report as a free pdf. I thought it would be helpful to ‘re-present’ some of the figures in a variety of ways. Over the last few years there have been some significant changes in the global film market. 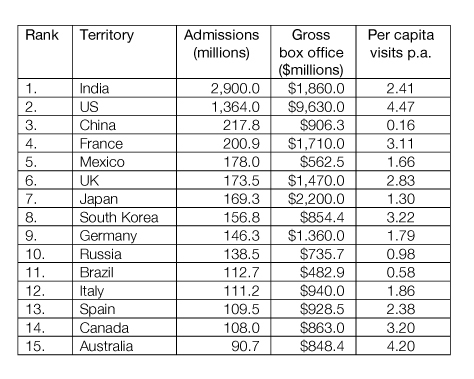 Table 1 shows the different national markets ranked by number of admissions in 2009. 1. India had a poor year with the strike/boycott which meant that major films were not released to multiplexes for several weeks. 2. France had an excellent year topping 200 million admissions for the first time for several years. The UK also did well, following several territories boosted by the success of 3D releases. This didn’t prevent France and the UK slipping down the table, however. 3. Overall, the biggest increase in admissions was in China where audiences have been growing at 20-30% over the last few years. Cinema in China is still a relatively urban middle-class experience. With less than 1 cinema visit per head, the Chinese industry has plenty of growth possible in the next few years. 4. The other big increases are in the traditional territories of mass audiences which had previously collapsed. Mexico has been on the rise for some time (though there was actually a slight fall on 2008) but the Russian and Brazilian advances are more recent. 5. High ticket prices inflate the position of some territories in the box office revenue rankings. This is especially the case in Japan– the second market by value, but only seventh in admissions. Germany similarly overstates its position. 6. The final column represents admissions per head of population. I’m not sure exactly how this is calculated – does it include the whole population or only those over 5 years of age, 7 or 14? I mention this because the highest figures (over 5 in Venezuela and Chile) don’t always seem to correspond to even a crude division of population into admission numbers. Nevertheless, some trends are obvious – generally, the English language territories have the highest per capita attendances – US, Australia, Canada, UK, Ireland (3.97). Is this just because of the common language base encompassing the most profitable industry? Perhaps, but it doesn’t explain Singapore (4.63) South Korea or Iceland (5.3). More likely, is the spending capacity of cinemagoers. Perhaps prices in Japan or Germany are too high? But why are the figures so low in Italy? It would seem that local factors still matter – Italy has a less developed multiplex sector and until recently the industry in many parts of the country tended to keep a low profile in the summer months when the international industry generally tends to put out the blockbusters. Air-conditioning looks like the answer. 7. Beneath the ‘Top 15’ are some significant territories. For instance, most territories in South East Asia are on the rise. Most have low per capita figures so expansion is possible, especially in Indonesia. Top at the moment is Philippines with 65 million admissions, followed by Indonesia (50 mill) and Malaysia (44 mill). 8. Some of the South East Asian figures are for 2008 and gathering data is a serious problem. Some territories are not represented in the guide at all – Bangladesh, Pakistan and Sri Lanka once had significant film industries with a mass audience. All have declined according to occasional reports, but no official industry data is available. This entry was posted in box office. Bookmark the permalink. Thanks for the valuable information. Another important factor to consider or begin to discuss in the courses linked from this site, and on this site are the hundreds of million Deaf and Hard of Hearing people around the world who have never been intentionally included in the huge cultural phenomenon of cinema or seeing movies-in-theaters. I’ve read that the demographics for the U.S. is the aging of the greater portion of the population (the aging “baby boomers”), and that most other countries actually have reversed situation, a growing portion of youthful citizens. Interesting — and important — observation, Greg. Induction loop systems are fitted in most UK cinemas and some films are screened with subtitles at some point in their run. The UK government provides this advice for audiences with hearing (and visual) impairment. I’m assuming that this is the case with modern cinemas in most territories. However, I’m sure access to screenings could still be improved and in territories where cinemas do not receive public funding support or where the business is not profitable there is even more to do.